Hammertoe is a contracture–or bending–of one or both joints of the second, third, fourth, or fifth (little) toes. This abnormal bending can put pressure on the toe when wearing shoes, causing problems to develop. Hammer toe usually affects the second toe. However, it may also affect the other toes causing them to move into a claw-like position. Hammer toes usually start out as mild deformities and get progressively worse over time. In the earlier stages, hammer toes are flexible and the symptoms can often be managed with noninvasive measures. But if left untreated, hammer toes can become more rigid and will not respond to non-surgical treatment. Corns are more likely to develop as time goes on–and corns never really go away, even after trimming. In more severe cases of hammertoe, open sores may form. 1.Pain or irritation of the affected toe when wearing shoes. 2.Corns (a buildup of skin) on the top, side, or end of the toe, or between two toes. Corns are caused by constant friction against the shoe. They may be soft or hard, depending upon their location. 3.Calluses (another type of skin buildup) on the bottom of the toe or on the ball of the foot. Because of the progressive nature of hammer toes, they should receive early attention. Hammer toes never get better without some kind of intervention. The most common cause of hammertoe is wearing short, narrow shoes that are too tight for your feet, causing your toe(s) to be forced into a bent position. This causes the muscles and tendons in the toe to tighten and become shorter. Hammertoe can also be caused by some kind of trauma, such as a previously broken toe. Hammertoe may be inherited. Studies have shown that genetics may play a role in this disorder. Hammertoe can be caused by muscle or tendon imbalance as a result of pronation, a very subtle type of gait that causes various types of hammertoe deformities. There are several treatment options for hammertoe. The treatment a podiatrist selects will depend on the symptoms you are experiencing, the severity of your hammertoe, previous treatments and other factors. 1.Trimming corns and calluses. This should be done by a healthcare professional. Never attempt to do this yourself, because you run the risk of cuts and infection. Your foot and ankle surgeon knows the proper way to trim corns to bring you the greatest benefit. 2.Padding corns and calluses. Your foot and ankle surgeon can provide or prescribe pads designed to shield corns from irritation. If you want to try over-the-counter pads, avoid the medicated types. Medicated pads are generally not recommended because they may contain a small amount of acid that can be harmful. Consult your foot and ankle surgeon about this option. 3.Changes in footwear. Avoid shoes with pointed toes, shoes that are too short, or shoes with high heels – conditions that can force your toe against the front of the shoe. Instead, choose comfortable shoes with a deep, roomy toe box and heels no higher than two inches. 4.Orthotic devices. A custom orthotic device placed in your shoe may help control the muscle/tendon imbalance. 5.Injection therapy. Corticosteroid injections are sometimes used to ease pain and inflammation caused by hammertoe. 6.Medications. Nonsteroidal anti-inflammatory drugs (NSAIDs), such as ibuprofen, are often prescribed to reduce pain and inflammation. 7.Splinting/strapping. Splints or small straps may be applied by the foot and ankle surgeon to realign the bent toe. 1.The surgery involves cutting or moving tendons and ligaments in the affected area. 2.In certain cases the bones on each side of the affected joint will be fused together. 3.Removing a small section of the bone from the affected joint. 4.The use of a pin to hold the toe in position while the bones heal. 1.Removing the wedges of the skin of the toes. 2.Tendon / muscle rebalancing or lengthening. 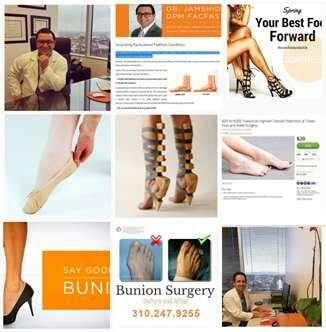 Often patients with hammertoe have bunions or other foot deformities that will need to be corrected at the same time. The length of the recovery period will vary, depending on the procedure or procedures performed. We perform our procedures in an outpatient setting. 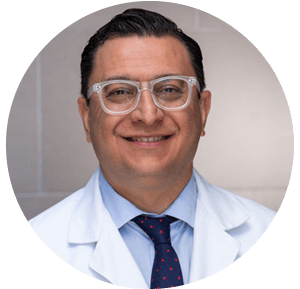 Dr. Jamshidinia is board certified by the American Board of Podiatric Surgery and is a Fellow of the American College of Foot and Ankle Surgeons. Dr. Jamshidinia offers treatment at outpatient surgical centers located in the Los Angeles, Beverly Hills, Thousand Oaks areas as they provide an excellent setting for this surgical correction and allow patients to go home the same day following treatment/surgery.